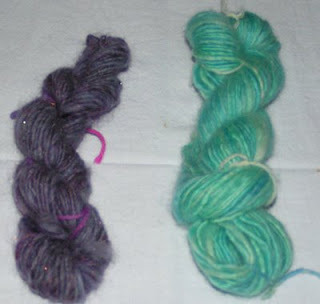 The Bobbilicious Files: We made yarn! At about, oh, five Monday morning I found myself with two children in my bed, scared to death, because there was a terrifying storm going on - hail, constant thunder, so much lightning that it looked like daylight. Then the power went out. The power stayed out until noon. My children were so bored - everything they enjoy is electric, of course. I wound up getting the polymer clay out for them to play with and baked it much later when the power came on. Well, even with the little lantern and a bunch of candles there wasn't enough light to knit on a sock, so I pulled out the kick spindle that I'm borrowing from Jenny and finished spinning the roving that's been on it. Khloe helped by actually spinning the spindle so all I did was the drafting. It worked out really well, so we got out my shiny new drop spindle and some new fiber and gave it a go. Well, it's not alot of yarn at all, but it's real yarn made by our little hands in the stormy darkness. Check it out! I really enjoy spinning. It's very calming. The drop spindle - which I don't really drop but spin on a book on my lap - is a bottom whorl and is a gorgeous ceramic disc. No, I didn't take a picture - my ducks are never in a row. I ordered a top whorl from etsy last night (must remember to stay away from the daily chum on lime and violet!) to see how it works. I don't think we'll be making anything with our little yarn. It's mostly a "look what we did" thing right now. I have more of the purple fiber, though, so maybe the second batch of handspun will become an item. No, it's not plied. It's the wonderful thick and thin single ply that costs a ton when it comes from a company. In conclusion, I have another addiction. At least this one is shared by the girl child. wow...that looks great for your first spinning! It looks very evenly spun too. It just looks so soft and cuddly.